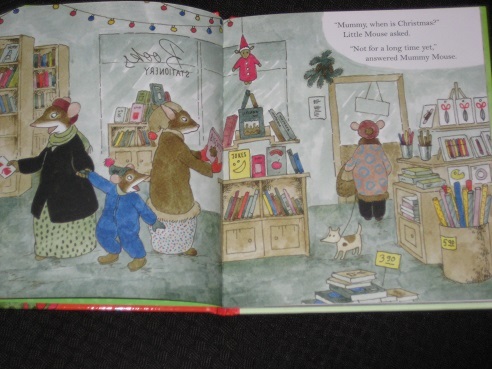 The book is called Little Mouse’s Christmas, and it’s written and illustrated by Riikka Jäntti (the translation is by Lola Rogers). Yes, because they had Christmas, and I’m looking forward to Christmas, too! My favourite part was when he decorated the Christmas tree because I like decorating our Christmas tree. No, it was easy (sometimes!). Yes, because they will think it has some funny parts in it, and maybe they will like the Christmas story. Hayley enjoyed reading the previous Little Mouse book to me, so I was more than happy to accept a review copy of the young rodent’s latest adventures. 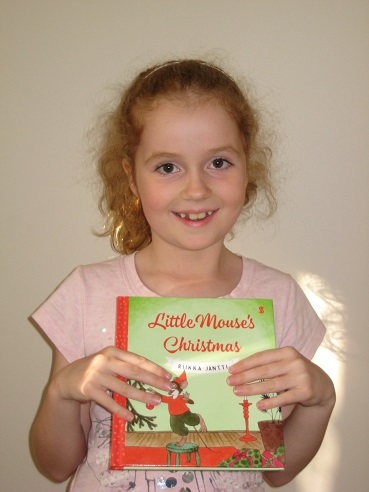 Once again, while the series is more suited to younger readers, Hayley had a great time reading it to Daddy and thinking about her own upcoming Christmas celebrations! Little Mouse and Mummy Mouse went to the market square to buy a Christmas tree. “Can we have this one?” Little Mouse asked. “I think it’s too short,” Mummy said. “It is expensive,” Mummy grumbled. But she got out the money. We reread the book together before writing the review, and several of Little Mouse’s experiences were rather familiar. November consists of the young mouse constantly asking if it’s Christmas yet, and Mummy Mouse is (unsurprisingly) a little short when her son wants to play in the snow during a shopping outing. As for the advent calendar, well, there’s a reason why they’re hidden at the top of the wardrobe in our house. Your daughter is getting review copies already? That is impressive!